From dolloping on vegetables to drizzling on steak, simmering up curries, and stir-frying noodles, this unique cookbook will prove that sauce is your new secret weapon in the kitchen. 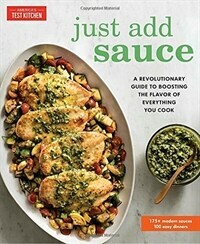 Up your cooking game with hundreds of flavorful, modern sauces paired with easy recipes that put them to use in creative, inspired ways. Many home cooks find sauces to be intimidating, equating them with rarified French restaurant techniques. America's Test Kitchen is knocking down that preconception with this ground-breaking cookbook that brings the flavorful world of sauces to life through the lens of home cooking. Take all of your meals to new heights with 230 simple sauces accompanied by more than 150 fresh and fun recipes that use them. You'll be amazed at the versatility of the recipes in this uniquely organized and beautifully illustrated cookbook. In addition to the must-have classics that will boost your cooking arsenal (think: Warm Brown Butter-Hazelnut Vinaigrette with a Frisee Salad, a bright and bold Thyme-Sherry Vinegar Pan Sauce to dress up a Weeknight Roast Chicken, and a Teriyaki Stir-Fry Sauce for an at-home version of Chinese takeout), we also dive into the wide world of simmering sauces (from piquant Thai curries to complex Mexican moles), yogurt sauces (we take this familiar dairy product and give it new life), relishes (from classic Italian caponata to restaurant-inspired Grapefruit-Basil), herb sauces (Moroccan Chermoula to Argentinian Chimichurri to French Persillade), and more to open up new realms of flavor in your kitchen. You'll find plenty of unexpected pairings that showcase the ways to put sauce to use in your everyday cooking.